Can you believe that summer is almost over? It feels like we just introduced you to this season’s trends a few weeks ago, and here we are at the very end of August. As you can imagine, life is busier than ever now that we have our girl, Liv, plus we’ve been working behind the scenes on some exciting new initiatives—and we can’t wait to share all of the details with you. 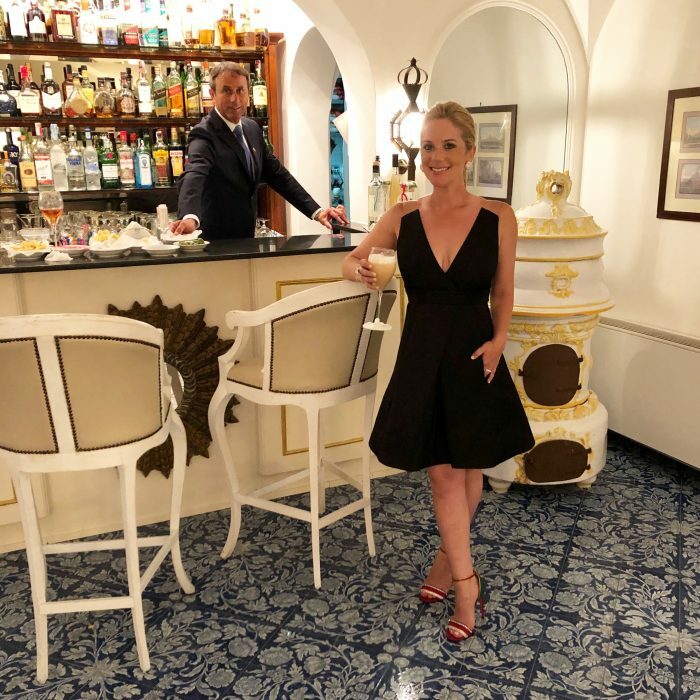 Since it’s the last week of summer, we wanted to reflect on all of the fashion highlights and the pieces we found to be the most wearable—and don’t worry, since so many of you have requested it, we’re telling all about our recent trip to Capri. And giving you an insider peek at what’s happening over here at the Stylist to a T headquarters. Since we always want to make shopping our style recommendations as seamless as possible for you, we’ve made a few key upgrades to our shop. As always all of the pieces we share are highly curated and vary in price point—from investment pieces to staple trends. We are so thrilled to announce that we are now working with Saks Fifth Avenue. We will be curating our shop and Instagram feed with their amazing pieces now through fall. We’ve decided to share personal stories with you over here on StyliststoaT.com in the newly launched Style Diary. Instead of simply offering style advice, we’re going to give you a true insider view into our lives and what really goes on behind the scenes. We’ve been listening to your feedback and hope you enjoy this exciting shift in direction. Now, onto our summer trend recap. Here are our absolute favorites. White. Clearly summer wouldn’t be summer without white. And this season brought us a mix of crisp, clean, tailored, and oversized options to choose from. Fashionable favorites included flowy dresses, white pant suits, denim, and swimwear. We also loved seeing white in accessories – jewelry, shoes, and bags. The perfect fresh summer go-to. Stripes & Polka Dots. Two staple patterns for summer, both polka dots and stripes got great, fashion-forward upgrades. Polka dots have been bigger and bolder offering up a bit of a retro feel a la Audrey Hepburn, and stripes are still having a moment on button up shirts featuring primary colors. Both are classic, fun, and carrying a feminine vibe and were especially hot in swimwear silhouettes. Ruffles & Ruching. Alex’s two favorite summer details. Ruffles this season have been bold, exaggerated, and extra feminine. We saw them most of all cascading down the front of tops, accented off the shoulder or cold shoulder pieces on both dressy and casual silhouettes. And ruching is offering up similar detailing that is equally chic and feminine. Ruffles are a great statement piece, and ruching has been perfectly figure flattering. Since we loved these trends so much, you probably saw Alex wearing them while we were in Capri in July. 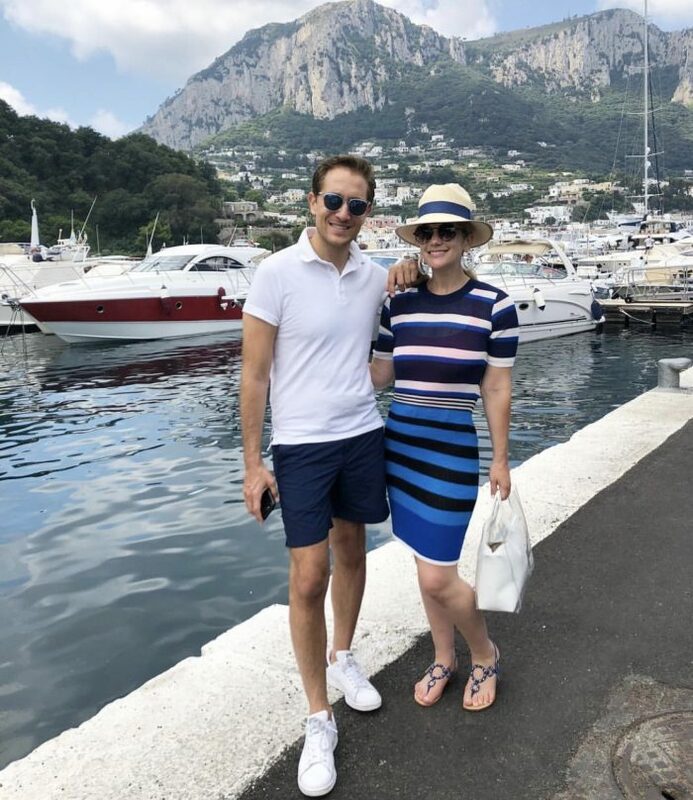 We were fortunate to take our first “parent” trip and visit the Amalfi Coast—our absolute favorite place on the planet. In fact, Michael spent most of his childhood traveling there with his family. And once we started dating, we tried to make it an annual tradition to visit at least once a year. This time around though it was extra special to get away together, and of course, shop the European selection of unique pieces and get our hands on a few things for fall. If you haven’t been to Capri, we highly recommend adding it to your list of must-see places. And if you’re planning a trip there soon, here’s are some key things to keep in mind. We suggest staying for a minimum of 5 days. Capri is located on its own island, you’ll have to take a ferry to get there. There are no cars in the town of Capri, but you can take a taxi to get from the port to the main center of town. First, you must spend time on the beautiful beaches which are very unique and on rocks. If you’re not at beach, then sitting by the pool and looking out at the gorgeous view because there isn’t a bad view anywhere you are on the island. If you’re feeling adventurous, our go-to activity are boat days. They are pretty spectacular. You can rent a variety of different boats and take them out all day and stop along the way for lunch. There are so many options of great lunch places either in AnaCapri, Positano or Nerano. Our two favorite lunch spots: Conca del Sogno and Lo Scoglio. We also love swimming in the Grottos after lunch (especially the green one). The next best thing is the Italian food. There are a number of restaurants of course, but our favorites are Aurora, Villa Verde, Da Giorgio, and Da Paolino. And our drink of choice is the bellini which is make with fresh pureed peaches. Whenever we visit Capri we feel like we never have enough time in one day. So, typically we switch off between boat and beach days to mix it up, and finish off our afternoon with some shopping. There are so many hidden gems that you find something new everyday. We love having drinks before dinner at our hotel and then heading off to a late dinner. If you are interested in a fun night out we always suggest the Taverna Anema e Core, the Italian disco. If you have any questions, let us know. We have become Capri experts and would be happy to offer more insight on how to enjoy this amazing place. Each year we look forward to this trip together and are excited to start to bring out little girl to experience it soon too!